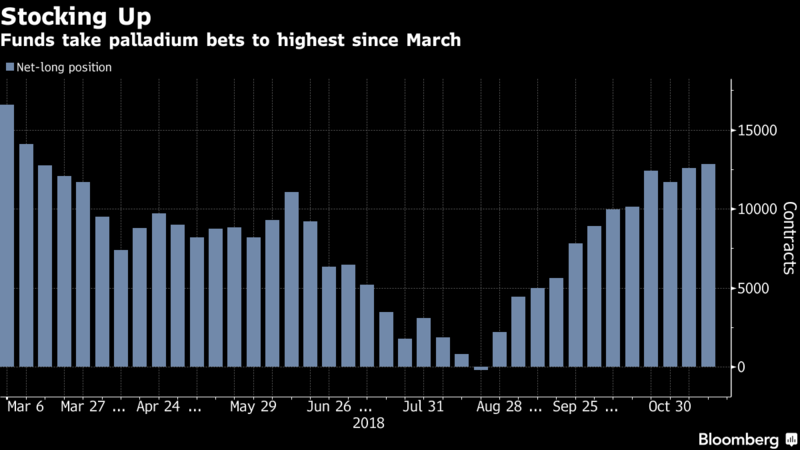 Palladium prices are shattering record highs, and investors are betting that tight supplies mean that the bull run is just getting started. The metal, used in pollution-control devices, has jumped more than 9 percent in New York this year, the best performance among major metals. Demand is roaring thanks to China, which is on a mission to reduce smog. Tougher pollution standards mean carmakers are using more in catalytic converters. Global production is falling short of the robust demand, and market forecasters including Citigroup Inc. are projecting further price gains ahead. Hedge funds are also wagering on an extended rally, holding the biggest positive bet on the metal since early March. Palladium is a thinly traded market. Much like sister-metal platinum, its production is extremely concentrated, with Russia and South Africa collectively producing about three quarters of the world’s mined supplies. Almost 70 percent of palladium demand comes from the auto industry, according to researcher CPM Group. Car sales have stayed relatively strong in most places, helping to insulate prices from the hand-wringing over global growth that’s dragged down many industrial commodities. Supplies are so constrained that users have turned to exchange-trade products to borrow the material they need. That’s pushed palladium holdings in ETFs to the lowest since 2009 as manufacturers seek supplies above ground, said Gold. Hedge funds are adding to their bullish outlook. In the week ended Nov. 13, money managers increased their net-long position, the difference between bets on a price increase and wagers on a decline, for a second straight week to 12,837 futures and options, according to data from the Commodity Futures and Trading Commission published Friday. That’s the most since March 6. Palladium futures jumped 5.2 percent in New York last week. The price — which hit $1,168.30 an ounce in Friday’s trade, the highest so far — was at $1,161.90 on Monday. One threat to demand: substitution. Historically, palladium has usually been cheaper than platinum, and therefore was used as a popular alternative since the two metals share many of the same chemical properties. But the recent rally has reversed the price relationship, and now palladium suffers the threat of substitution from platinum. Still, manufacturers need 18 to 24 months for such changes, so that probably won’t be an issue in the immediate future, Suki Cooper, a precious metal analyst at Standard Chartered Bank in New York, said by telephone.